A study asking 980 shops how often they’re reimbursed for 26 “not-included” procedures found that no major insurer outright rejects them — and yet some shops neglect to even attempt to be paid for them. The conclusion by Collision Advice, which conducted the survey along with Crash Network and released the results Wednesday, was that there’s no harm in asking. It gave the example of masking the engine compartment. About a third of shops “always” or “most of the time” get paid for it, and when you factor in “sometimes,” your odds of having at least a chance of reimbursement are better than 50-50. So by factoring in the “sometimes” reimbusement, you could also argue that odds of insurers erring on the cheap side were above 60 percent. But despite these odds, a third of the shops still reported never having asked to get paid, and Collision Advice urged them to do so for any “not-included” task. The survey does acknowledge that the results varied by region, insurer, and perhaps most telling, direct repair program status. But it still indicates that you should ask; none of the 26 items were “universally rejected,” according to a news release about the survey on Wednesday. “The surveys will help shops understand what these operations are, and whether other shops seek and receive compensation for them – or if they truly are ‘the only one,’” Anderson said in a statement. The new findings were similar to the early findings released in May from the National AutoBody Research’s VRS Procedures & Practices Survey. The study, which included about 150 April responses from collision repairers in 34 states, found that while shops deliver service far beyond what they’re getting paid to do or even putting on the bill, insurers remain tepid about 12 additional line items that repairers deem necessary. 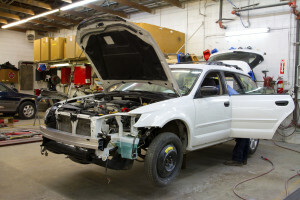 Those procedures ranged from corrosion protection to pre-fitting non-OEM parts to washing the car before giving it back. However, shops who bother to invoice the work still have a better than 50-50 shot of payment from at least one insurer, NABR found. Most repairers weren’t including the procedures on estimates “often because they don’t believe they will get paid,” according to NABR. We’ve contacted Collision Advice for more information; continue to check Repairer Driven News for updates.